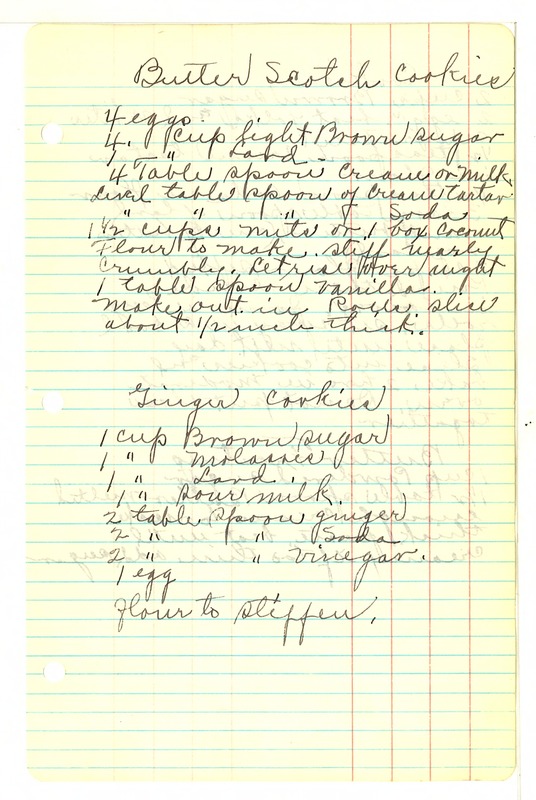 Butter Scotch Cookies 4 eggs 4 cup light Brown sugar 1 " Lard 4 Table spoon Cream or Milk Level table spoon of Cream tartar " " " of Soda 1 1/2 cups nuts or 1 box coconut Flour to make stiff nearly crumbly. Let rise over night 1 table spoon vanilla. Make out in Rolls. slice about 1/2 inch thick. Finger Cookies 1 cup Brown sugar 1 " Molasses 1 "Lard 1 " sour milk 2 table spoon ginger 2 " " Soda 2 " " vinegar 1 egg flour to stiffen.